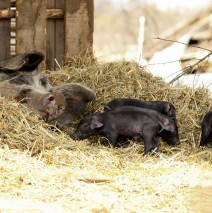 Our mixed heritage breed pigs have been raised on rotated pasture from birth. Free to root, wallow and express their pigginess, their stress-free life exhibits itself in the best, healthiest pork you have ever experienced! Supplemented with organic grain, vegetables from our organic garden and finished on organic apples from our farm, our pork has a taste that cannot be compared. Our pigs, with their amazingly designed noses, turn over the soil, uproot brush, fertilize, and flip rocks out of our marginal pastures to help us restore the land. We sell pork by the side, in family packs and by the cut. Please contact us for pricing and availability.